Wonderful. We should, had the opportunity arisen, have certainly snapped up this 'Jesus' vase which looks extraordinarily pretty filled with summer flowers. We are also pleased to read in your reply [previous post] that you have now had much needed rain. Here it continues to be beastly hot with occasional thunder storms giving little in the way of respite. Thirty years ago, World of Interiors had a short feature on a trendy British potter. The piece I found most arresting was a tall, blue-and-white vase with a motto referring to "the Unbearable Ugliness of the English Working Class." The vase is beautifully formed and the posey is perfect for it. I love the meaning behind this Staffordshire piece. I personally do not have porcelain finds with any lettering. I do have a dish that belonged to my mother, who kept it on her bedroom bureau. It is a reference to my father, two brother and me, and it says in French, "A father and three sons make four devils for the mother!" The interpretation tells us so much about the interpretor, right? Because I'm afraid my first thought was that you'd bought a vase emblazoned with an expletive. Not my finest hour. I wonder if this has some ecclesiastical use, or if it was part of a set. Given your explanation, flower arrangements in it would seem somewhat funereal. Lots of utilitarian Chinese objects have mottoes on them, usually of the 'good luck' variety. But for Western items, other than souvenir items or personalized objects like shaving mugs, I have never seen anything quite like this. I can't believe that it wasn't snapped up by the first browser. Well, lucky you--don't you just love running across yard sales of this sort! In my next life I want to cruise the back roads of upstate New York, maybe on my way back from a return trip to Brimfield. "Jesus Christ" - you have such an eye. It was meant for you and that posey literally brings me to my knees. Alleluia. I forgot -- I also have a rather pretty faience ashtray, one of a dozen made up in the Twenties for the senior partners in a well-known Manhattan law firm. The inscription reads, bon avocat, mauvais voisin. To the best of my knowledge, this was just a joke. That is a perfect vase. So many meanings to infer. Perfect. I recently fell prey to a vase at anthropologie that says "let them eat cake." As a gardener and one of the 99%, I couldn't resist the temptation. And it's blue and white! Divine providence at work here Reggie. Posey, plus vase = a holy alliance. The vase was meant for you. Wonderful find. This is the cat that killed the rat that eat the malt that lay in the house that Jack built. The above written on a small cup avec illustrations. It is transfer printed I think and was bought in a small junk/antique shop in Paddington, Sydney about 1963.It was the day and my sister and I got lost and were taken to the police station to await my worried parents. I don't know which part of this I liked better-the fact that you pulled over to shop or that you knew this was a good selection! I would have been one of those people who passed on it without really knowing why? It's always an education here and the little vase looks so pretty. I have retired U.S. Navy china from the officers' galley. I enjoy thinking of who sipped coffee from the cup and where he may have been in the world and what he was doing (e.g., on watch on the bridge in the middle of the night or in his cabin at the end of a long day at sea). What a wonderful vase! I find strangely labelled items fascinating. I have a small, 19th century drinking glass etched with the Lord's Prayer and a tiny cherubim. Also, a set of three silver spoons of different sizes engraved "Bathroom." I also love my collection of "Tom and Jerry" bowls. Very nice find,this vase was calling you. I love trumpet-shaped vases! 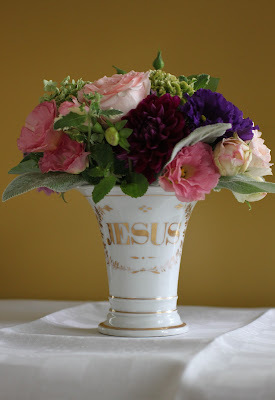 I have Paris porcelain cups and dishes with sayings and inscriptions upon them and at one time owned two vases with portraits of Jesus painted on them.